Expand your mind and your jewelry collection. 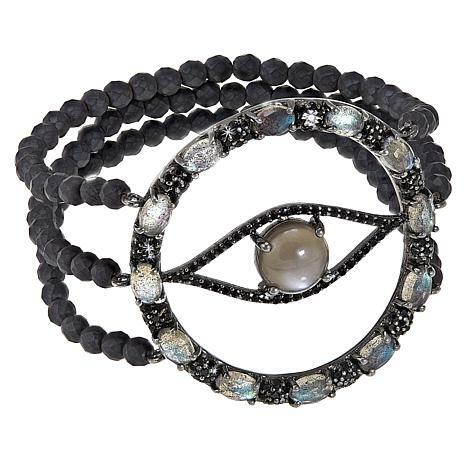 From the gorgeous gemstones to the evil eye design, this trendy piece will turn heads. This is a unique piece. Beautiful design. The only issue is that the bracelet is a little tight. Loved everything about it - the fit was perfect- I returned it because the small beads were not real. They never mentioned during presentation otherwise I would not have purchased it. I would repurchase if they changed them to real. 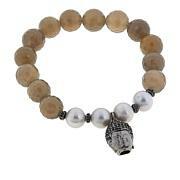 The rarities brand is about real and rare gemstones. Im surprised that a good portion of this very unique bracelet is manmade. 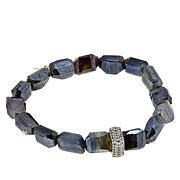 The 3 rows of manmade hematite reduce the beauty of this bracelet. Faceted black spinel should have been used and I would have paid more for all real gemstones. 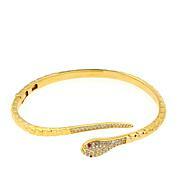 Please re-do this bracelet with black spinel bands. Will be returning. so sad to send this back, Carol please make the band for those of us that have 7.5 in wrist. It is worthy of a 5 star for the design, but too tight. I am a big fan of eye designs that i love but i cried as have to send this back as is just too tight. 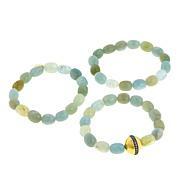 The green labradorite beads that are attached are just plain ugly. This supports my theory that some designers will use leftover beads b/c they don't know what else to do w/them. I will keep this bracelet and, ONCE AGAIN, take it to my jeweler to have those labradorite beads replaced w/faceted black spinel, which should've been used in the first place.